March 3rd is celebrated as the Girl’s Day, or the Festival of Dolls. It’s the day to pray for healthy growth and happiness for young girls. People display graceful dolls in ancient court costumes on a tier of 5 or 7 shelves covered with scarlet cloth. These dolls represent the Emperor and Empress, the court ladies, the ministers and the court musicians. The girls are expected to be as elegant as these courtly ladies. People began displaying dolls in the Edo period.They are dressed in beautiful ancient court costumes. 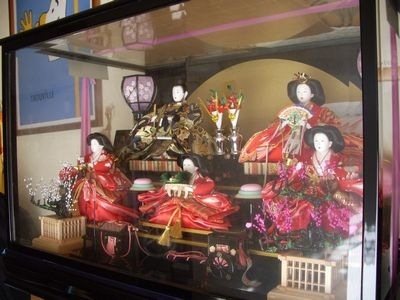 The dolls depict the imperial court. Young girls wear their beautiful Kimono and get together before the display and have a good time, eating sweet rice crackers (Hina arare) and drinking white sake (Shirozake). It isalso known as the Peach Festival. We decorated it. We put it in order when it decorates from the Festabal front and we pass March 3, . There is a legend of delaying daughter’s marriageable age when decorating it indefinitely.